So, let’s just skip my few paragraphs of rambling and skip right to the recipe today, okay? I’m on round two of a cold that has been making the rounds in our house and hoping that I’m the only one who has to go through it twice, because it’s not fun. Anyhow…not too much to say otherwise, except that you really need to try these green beans! They are so delicious! I wasn’t too sure about the combination of the honey mustard and the bacon when I was putting it together, but it was definitely a hit. Experiments that turn out great are my favorite! 1. Cook bacon in a large skillet until crisp. Remove with a slotted spoon to drain and pour out all but 1 tablespoon of the bacon grease. Reduce heat to medium-low and add the thawed green beans. Cook for about 5-10 minutes, until beans are tender. 2. Meanwhile, whisk together olive oil, mustard, honey and vinegar. 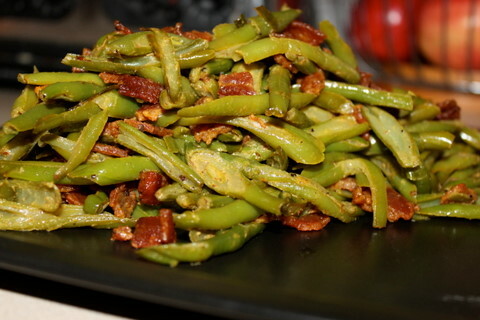 Remove green beans from heat, stir cooked bacon back into the pan and pour on dressing mixture. Toss to coat well. Season well with salt and pepper to taste. Serve immediately or at room temperature. NOTE – If you want to make this even easier, you can use 3 tablespoons of prepared honey mustard mixed with 1/3 cup olive oil. This is almost exactly my mother’s Thanksgiving and Christmas green beans recipe. But she (and now I) also like to throw in some onions to add some extra pop to the flavor. See what you think. These are tasty, and I don’t even care for honey mustard. I didn’t have any, so I used dijon and a little honey. Great with fresh green beans, too.